The Texas Hold’em variant of poker has become the most popular poker variant played in Europe, the USA and many other countries. The game has taken on an almost cult status with television shows and video games released having large audiences. Texas Hold’em differs from other main poker games because all players may utilise the cards on the table to make the best hand possible. Although poker, and particularly Texas Hold’em poker, can be played without money, the game truly comes alive when utilising money or chips in lieu of real money. Because of the popularity of poker, card sets and poker chips are readily available in most shopping centres. So before beginning, get some poker chips, or save all your coppers, these will make the game more fun. In Texas Hold'em poker the play can vary depending on not only the players, but also where you play. In many games ‘antes’ are used. An ante is a poker stake that the dealer will call at the beginning to build up the money pot in the game. In many matches, it starts with the two players on the left of the dealer setting down an agreed amount of money so that the game can start with some money on the table. This is known as placing the small blind and the large blind on the table. The player to the immediate left places the small blind and then the player to the left of him/her places the large blind. These can be determined by the group or dealer before the game. The blinds will count towards the first round of betting and generally when being set at the beginning will be chosen based on the limit of the poker game. For example, it is common for the small blind to be £2.50 and the big blind to be £5 in a £5/10 limit game. Once the blinds have been established, the dealer will shuffle the standard 52 card deck of playing cards and deal them out to each player. Each player will be given two cards face down in front of them. These are generally known in the game as ‘pocket cards’. The betting then progresses with the player to the left of those who placed the blinds. This player decides whether he/she wants to fold, call or raise. Folding means you are throwing your cards back to the dealer and won’t take part in this round. Calling means you are staying in and aren’t raising. Raising means you can bet more money, this is usually done if you have excellent cards in your hand or are a particularly good bluffer! Many players at this stage will stay in the game even if their cards aren’t that great as they will try and wait for the flop or to see how other players proceed. Poker is a strategy game where keeping track of other players can make a huge difference to winning and losing. The game continues around this way so each player has the choice of what they’d like to do. Some players may raise and thus the round will go on again asking that everyone who wants to stay in place the money in that the raise stipulated. All those players who are now left in will get to see the dealer place three cards on the centre of the table. Once the round has ended, the dealer removes the first card from the top of the pile. This is to prevent cheating and is often known as the ‘burn’ card. The dealer then places three cards in the centre, face up. These cards become communal cards, which means they can be used by anyone to improve the card in their hand. These cards are known as the flop. Once these cards are placed, the next round of betting will commence. The players will then be able to look at their pocket cards and the cards on the table to see if they have anything that constitutes a ‘good hand’. Play proceeds around the table with each individual again making the choice of whether to call, raise or fold. At the end of the round, the dealer will burn another card and place another onto the table. This card is known as the ‘turn’ card as it could possibly allow a player to make a five card poker hand. Play continues in much the same way until the dealer places down the final flop card known as the ‘river’. Players who are still in the round can now use any of the five cards on the table to improve their own hand and hopefully give them a chance at winning the round. After the river card has been played, there is a final round of betting and then whoever is left in must reveal their cards to the other players. Whoever has the best hand at this point wins the game and wins the pot. In Texas Hold'em, the winning hand ranks are as follows, from lowest chance of winning to highest. Straight – Five cards of sequential order. For example, 5, 6, 7, 8, 9. Aces can be low or high. Straight Flush – A straight of all the same suit. The combination of a straight and a flush. Royal Flush – A straight of one suit that uses the ace high and the king, queen, jack and ten. 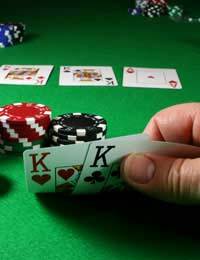 Texas Hold'em has numerous strategies for winning and even then you can't be guaranteed to win a hand. Many great players go to great lengths calculating odds and percentages for winning, but for the beginner there are a few main strategies to implement to help you with your game. Bluffing of course is the core trick in poker and if you can deceive the other players into thinking you have a better hand than them, you're already in with a good chance of winning. If you decide to bluff, use it wisely, the trick is to not overuse it. If there are less players at the table, it's easier to bluff them. Also, the pre-flop strategy can be the key to winning at the poker table. Before you start betting wildly, take into consideration a few different things. Firstly, how many people are there at the table. If you have a lot of people in play, there's a higher chance that someone else will have a good hand that is better than yours. Have a look at how much money you have also, the more money you have, the higher the risks you can take. Certain players at your table may be very aggressive players also, if so be careful about betting or bluffing. Let them keep playing on when you have a fairly weak hand and when you have a strong hand, go get them. Your betting strategy in Texas Hold'Em poker is also very important to your game and chances of winning. There are various ways you can work your betting out, mainly you want to try to lure in others to raise when you have a good hand, or force them to fold believing you have a good hand even when you don't. There are hundreds of variations on Texas Hold'em poker available and some of the main ones are known as double flop Hold’Em, pineapple, Omaha and blind man’s bluff. Each have their own merits, however it is best to master regular Texas Hold'em first before moving onto any of the other variants. A real poker player can learn the game easily, but take forever to master it since much of it is about reading other players and learning to bluff your hand. It takes tremendous dedication and confidence to bluff other players at a poker game, but with practice even beginners can learn to calculate the best time to bet and the right time to bluff or fold.